NEW: Armoured case included at normal price! The Hypercam 183C PRO TEC Cooled camera is the next step when it comes to astro-imaging, with the 20mp Sony IMX183 sensor, amp glow reduction and high sensitivity, for extremely smooth, detailed images. Temperature sensor, with data available in realtime. Heated optical window to prevent dewing and fogging. Internal, replaceable, rechargeable dessicant cartridge, plus one spare. Two extra USB2.0 ports and internal USB2.0 hub to connect filter wheel and guide camera. * Separate 12v power supply included to power TEC with choice of USA, EU or UK Plug socket. Click here for more SC PRO features. Just download the latest SharpCap, connect your Altair Astro camera, and register your free SharpCap PRO license! Download SharpCap 3.0+ now to take advantage of this special offer. TEC cooling: Cooling reduces random thermal noise during long exposure imaging. The internal Thermoelectric cooling system (TEC) unit is controlled with your imaging apps, allowing you to set the temperature (which is recorded in the .FITs file header). The Hypercam is designed for consistent, reliable deepsky imaging at up to -45 below ambient temperature. For the IMX183 Sensor, the most appropriate cooling temperature at gain 400 is approx. – 10/15°C Absolute, beyond which, no real gains are made. Anti-fogging heated optical window. Every precaution has been taken to address the most common issues with cooled cameras. The optical window is warmed by special heaters to stop fogging and condensation at low temperatures. To inhibit sensor-frosting, the sensor chamber is sealed, and dry air purged during assembly in a special atmosphere. The sensor chamber has a replaceable stainless steel desiccant cartridge with spare. The dessicant cartridge can be recharged by placing it in an oven at 120C for a couple of hours after removing the mini O-ring. Two rear USB2.0 ports for accessories. Save on cabling by connecting your guide camera, filter wheel, or focuser to the rear USB2.0 ports and internal powered USB2.0 hub. AltairCapture: Unlike cheaper cameras, Altair Astro has spent considerable time improving the extensively featured and intuitive AltairCapture software, which can be downloaded from cameras.altairastro.com. AltairCapture is a stable 64 bit Windows application, which allows full control of the camera in high speed video or still mode. It includes extensive automation features, and supports all the major file formats useful for Astro-imaging and professional scientific imaging in 16bit stretched, 12bit or 8bit mode. Furthermore, the popular SharpCap and Firecapture are also natively supported. ASCOM drivers are also available for download at cameras.altairastro.com where you can also get regular driver updates. The installation process is very simple, starting with installation of AltairCapture which contains the driver base. SharpCap PRO: Altair Astro have worked closely with SharpCap developer Robin Glover since 2015, to fully integrate Altair cameras with SharpCap at a basic level. Now, Sharpcap PRO enables even more features with this camera, such as software driven polar alignment (more accurate than any other method we know of), live flat-frame subtraction and live darkframe subtraction. The fast, accurate polar alignment feature in SharpCap PRO is a life-saver for imaging, minimising setup time. Support & warranty: Altair delivers proper English-speaking support with a 2 year manufacturer warranty against defects in materials and workmanship. New users should visit Altair Camera Google User Group where you can get answers to technical questions. The group is also a great area to share tips and techniques, to get the best out of your camera. The AltairCapture software interface supports most European languages including English, German, French, Indonesian, Japanese, Korean, Polish, Russian, Chinese, Spanish, Thai, and Turkish. The Hypercam platform with Trigger Mode: The Hypercam platform supports “Trigger Mode” to make long exposures of over 5 seconds easier to control. With most cameras, in normal video mode, you have to wait for an exposure to complete before the camera will accept, say a command to abort the frame, for clouds, aircraft, or an alignment issue, like kicking the tripod and so-on, changes in gain, exposure time, or re-aligning or refocusing. For long exposures, normal video mode is inconvenient, especially for video astronomy and deep-sky imaging, however in Trigger Mode, you can stop the camera instantly (even if you are half way through a long exposure) change the settings, and re-start the capture. Onboard 2port powered USB 2.0 hub (USB3.0 input, 2x USB2.0 ports output). 12v Power supply for use in TEC mode (camera will work in fan mode without it too). 1.8m High-speed USB3.0 cable. (Camera is also USB2.0 compatible). Optional waterproof impact armour case with foam interior to hold camera and accessories. Approx. 60% ~98% of above depending on host device. * Based on average user reports. May be revised as we get more data. The shorter the exposure duration, the faster the frame rate. An expensive PC does not guarantee a fast frame rate because board architecture varies. NOTE: Windows 10 is recommended for best performance, with 2013 or later machine USB host controller v1.0 or later. ASCOM fully supported with drivers downloadable at cameras.altairastro.com (opens new window). SharpCap and APT (3rd party applications) are also fully supported with native drivers for seamless camera control. USB Port & Cable: 3.0 USB Cable, 1.8m cable (USB2.0 also supported). Cooling: High Performance Thermo-Electronic Cooling System connected direct to rear of sensor. Warranty: 2 years manufacturer warranty against defects in materials and workmanship. Return to point of purchase with RMA#. 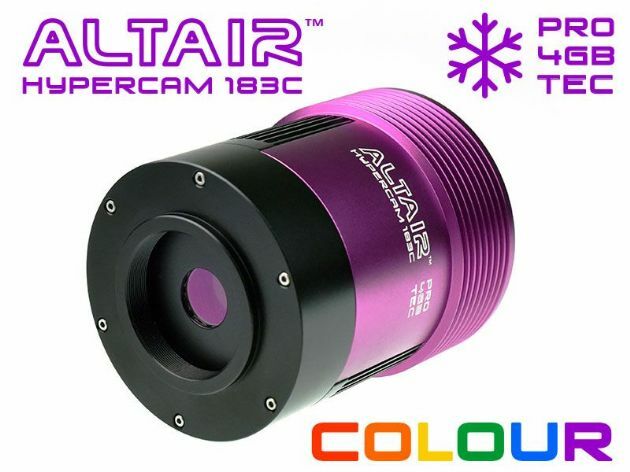 Altair Astro Premium 2" CLS-CCD Filter w AR Coating (Code: F200CLSCCD) for imaging emission nebulae in light polluted urban environments. Altair Hypercam DSLR Lens Adapter for Canon EOS or Nikon lenses. (Codes: CLA-EOS and CLA-NIK). Please Note: Altair Astro and dealers reserve the right to change the product specification and/or price at any time without notice.